In conjunction with the Education Technology Conference in Orlando, Google announced an expansion of Chrome devices and content for educators and students on Wednesday. Google Play for Education with digital textbooks is starting to roll out to a few schools now with broader access in the future, and Google is featuring several Chromebooks(s goog) and an Android tablet for the classroom. Chromebooks have been making great strides in the education market, accounting for an estimated 1 in 5 laptop purchases in the third quarter of 2013. Toshiba’s Chromebook 13, shown off at CES, will be available to schools for $299 while Lenovo’s ThinkPad 11e can be purchased for $349. These join the previously announced Dell Chromebook(s dell), which is aimed at students. Samsung will offer a special version of its Galaxy Tab for the classroom in April. Devices are only part of the story, however. Google Play for Education is a classroom-focused place where students and teachers can find or distribute education materials such as videos, apps or books. 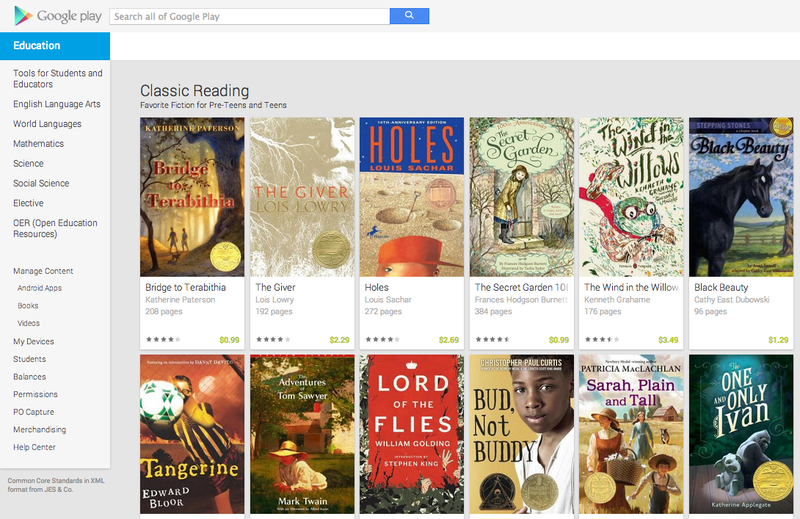 Google will soon “add thousands of K-12 books” to Google Play for Education where students can access the materials and view them on a Chrome OS or Android device.